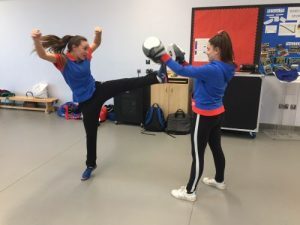 Storm Family Martial Arts were delighted to run a Kickboxing & Self Defence Workshop for the 1st Priestwood Rangers Girl Guides group this week. Thank you to Felicity and Olivia for arranging the event which was lots of fun for the girls and also for us. 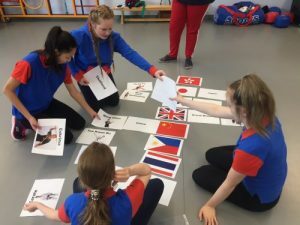 We started the workshop with a team building game where the girls had to match 8 martial arts (Karate, Tae Kwon Do, Wing Chun, Eskrima, Boxing, Kung Fu, Judo and Thai Boxing) with the matching flag and country. They were allowed to ask for clues but each clue cost the team 10 push ups ! We then moved on to a warm up drill with fun partner exercises to get the muscles warmed up and to stretch out our bodies to avoid any injuries. After a good warm up we looked at the basic kickboxing stance, kickboxing footwork and kickboxing guard. Basically, this means the girls learnt how to stand and move in the correct posture. We were then ready to do our first strikes and we looked at a jab (a punch with the lead hand) and a cross (a punch with the rear hand). Once the girls showed good control we got the focus mitts out and the girls practiced on the pads with a jab + cross (or 1 + 2) combination. Once the punched were looking sharp we added our first kick… a front kick ! This is one of the easiest kicks to perform and is a great way to build confidence as it can be mastered quite quickly. After well deserved water break we moved on to Self Defence. We explained that the best form of self defence is to avoid trouble altogether by being aware of your surroundings and planning ahead (to identify possible dangers) and we explained that when involved in a potential altercation the best form of self defence is to simply WALK AWAY (or run if needed) as avoiding a fight is always the best option. After this conversation we looked at what you can do if someone a) grabs you by the wrist, b) grabs both your wrists or c) grabs one of your wrists with both of their hands. The girls were shown 3 different ‘breakaway’ techniques and were fast learners. After one hour we brought the workshop to a close and answered a few general questions. 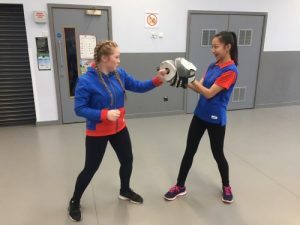 The girls showed a great passion for learning and we spotted a few natural martial artists in the mix. 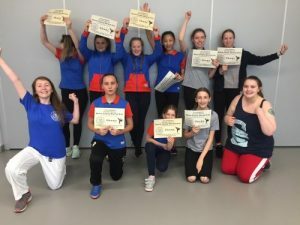 Thanks again to all the girls of the 1st Priestwood Rangers for a fun Kickboxing and Self Defence workshop at our Bracknell Academy.